It's not easy being a Reds fan these days. Trust me - I know. But Carling Coffing is not easily daunted, whether in her choice of baseball teams or in the pursuit of the LPGA Tour. Carling will be playing for her LPGA card at the Q-School finals in December. She got into Q-School finals through the Florida sectional. The pressure of qualifying tournaments can create some big scores in final rounds. But Carling went the other direction at the sectional - she opened with a 79, but kept grinding and posted her best score of the tournament in the last round to advance to the finals. Coffing is an Ohio native who played collegiately at Ohio State after winning the Ohio state high school championship. She turned pro in 2008 and got into 10 events on the Duramed Futures Tour. In 2009, she played 17 Futures tournaments, improving her scoring average and money list position and making 13 cuts. 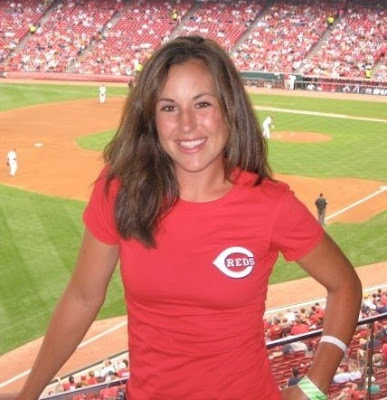 Carling also put the communications degree she earned at Ohio State to use in 2009, shooting video features for the Futures Tour website, and doing a vlog for the Golf Channel website. Some of those clips are on YouTube and we've posted one below.